As a follow-up to my previous post on How To Avoid Outrageous Data Roaming Charges, I have to point out that AT&T is now offering a 500 Mb data plan that can be combined with their prepaid voice plans. It is not destined to be used with an iPhone but it is rather easy to set it up using a custom APN profile thanks to the APN changer website! 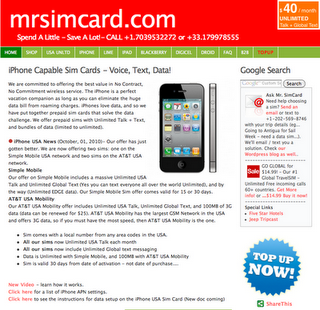 Mr SimCard's advice is to connect to a wifi hotspot once you get to the USA in order to set the APN using this website. My advice is to email the APN profile to you before leaving your home country, it will then sit in your iPhone inbox and you'll be able to install it as soon as you turn your iPhone on in the US! If you want to call your home country or any other country, use a Google Voice account and the Google Voice iPhone app with your AT&T Sim card! International calling rates are amazingly low. The Google Voice app dials a US number that is forwarded to your desired calling destination anywhere in the world, you are hence only charged for a call to the US by AT&T (and Google Voice will charge you for the international part of the call). No VoIP call quality issue there since it does not use VoIP. According to your pots,I like this AT&T plan.But my iPhone is restricted by o2 network.So i needed to unlock my iphone.For unlock i referred Unlocking4u.com Now i really enjoy with AT&T prepaid plan. Keep Sharing these Kind of Articles……I Reallly like it……. Best post share…..Keep Sharing!! I Really like this Post…..